Monster mother guilty of murdering toddler A mother described by police as a "monster" has been found guilty of murdering her two-year-old son. 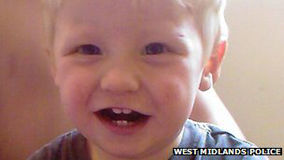 "> A mother described by police as a "monster" has been found guilty of murdering her two-year-old son. A mother described by police as a "monster" has been found guilty of murdering her two-year-old son. Keanu Williams died in January 2011 after being found with 37 injuries, including a fractured skull and torn abdomen in Ward End, Birmingham. 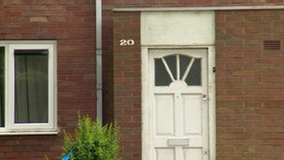 Rebecca Shuttleworth, 25, of Cottingham Road, Manchester, was convicted after a five-month trial. Det Ch Insp Caroline Marsh said it was the worst case of child abuse she had seen. Shuttleworth's partner Luke Southerton, of Hagley Road, Birmingham, was cleared of murder but convicted of one count of child cruelty. 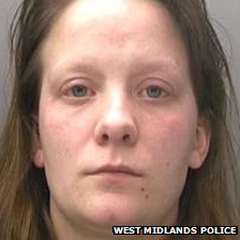 Shuttleworth, formerly of Hay Mills, Birmingham, was also convicted of four counts of child cruelty. The pair, who had both denied the charges, will be sentenced on Tuesday. A serious case review into the role of all the agencies that came into contact with Keanu and his family, including social workers and the police, is due to be published soon. Jane Held, chair of Birmingham's Safeguarding Children Board, admitted chances to take action had been missed. "It is clear from this trial that professionals in the different agencies involved missed a significant number of opportunities to intervene and take action," she said. Police said that Keanu, who was moved around England by his mother, may have "slipped through the net" by not staying in one local authority area for long. During the trial, the jury heard Southerton called 999 from his flat at about 19:40 on 9 January and emergency crews arrived to find Keanu, also known as Kiwi, collapsed on a sofa. The toddler was confirmed dead later that day. The trial heard many of the injuries found on his body could have been inflicted up to 48 hours before the emergency call was made. Outside court, Det Ch Insp Marsh said: "It's extremely difficult to understand how someone could do that to their own child. "Rebecca Shuttleworth is clearly somebody who is not like a normal member of society. In the past, I have described her as a monster and perhaps I would stand by that." She added: "I don't like to imagine the kind of death this little boy suffered because it clearly was horrendous. "He did suffer terribly at the hands of his mother who should have loved him unconditionally and clearly she did that to him. "This is the worst case of child abuse I have ever seen." At the start of the trial, prosecutor Christopher Hotten QC told the jury Keanu's injuries had not been an "isolated event" but were the culmination of a long period of ill-treatment. He said the fact Shuttleworth had not sought help for Keanu "until it was too late" proved she knew his injuries were "incapable of sensible explanation". A post-mortem examination found there had been bruising to the boy's body consistent with him having been struck with an object such as a stick or rod with some force. A fist-sized tear was also found in part of Keanu's abdomen, which had caused substantial bleeding, the court heard. In a statement, after the verdicts were announced, Keanu's aunt Angela Shuttleworth, 26, said his death had "torn the family apart". She said: "Since the tragic death of Kiwi, we haven't been able to grieve or say goodbye to him properly. "We hope now this is over we can lay Kiwi to rest and begin to have some closure." Police said Keanu had lived with his mother in several places in the last six months of his life, including with his aunt, his grandfather and with Southerton. Keanu was born in Torbay and brought to Birmingham in March 2010 when Shuttleworth moved back to the city and started a relationship with Southerton. Police said the toddler had "30 visible burns and injuries to his tiny body" and lived a "chaotic" and seemingly "very nomadic life". Wendy Bounds from West Midlands Crown Prosecution Service said: "Keanu sustained a series of increasingly serious, unexplained or inadequately explained injuries. "For much of the time he had been left alone in a room to suffer in pain. "There was no medical attention sought at any point from Friday night [of the weekend he died] until his mother noticed on Sunday afternoon he was not breathing." Both defendants were on bail throughout their trial, which heard evidence from more than 70 witnesses. Shuttleworth was remanded in custody following the verdict, ahead of Tuesday's sentencing, while Southerton was again bailed.